A coalition of civil society organisations in Kaduna on Monday rose from a meeting to issued a seven-day ultimatum to Senator representing Kaduna Central and Chairman, House Committee on Foreign loans, Shehu Sani to ensure that the $350 million loan request by the state government scales through, or face consequences. Briefing newsmen in Kaduna on Monday, Comrade Zubairu Mukhtar	and Comrade Richard Augustine, Chairman and Secretary respectively said, the lawmaker and his pay masters should as a matter of urgency hands off and reverse their position to stamp the government of Kaduna state from accessing the loan. According to the text read by the chairman of the coalition, “Kaduna State does not belong to any individual. We the people of Kaduna State stand in solidarity to the leadership of the State to acquire the loan of $350 million for our state development. “After seven working days, we the people would mobilise ourselves in our thousands and match to the national assembly in solidarity to the leadership of Kaduna for the said loan to be granted in the collective interest of the people of the State. We so hope that Sen Shehu Sani would do the needful and address his committee members on the need to approve with immediate effect, the loan requested by the good people of Kaduna State. “Ladies and gentlemen, we have resolved to expose Sen Shehu Sani act of injustices and evil plans to the government of Kaduna State and the entire people of the state. “We resolve to give Sen Shehu Sani seven working days to do the needful by respecting himself and hands off from trying to delay or deny Kaduna state access to the loan in his capacity as chairman Senate committee on foreign loans,” the coalition stated. They argued that any differences Sen Shehu Sani has with the State Governor, Nasir El-Rufia has nothing to do with the over 12 million people of Kaduna State, as such any attempt to block the loan by the lawmaker as the Chairman of Senate committee on foreign loans is a clear betrayal to the people of the state. “You may have been aware of public outcry of the wicked and mischievous activities of Sen Shehu Sani to the people of Kaduna State. This situation and his actions has become very worrisome to the entire people of Kaduna State especially coming at a time where the state is in dire need of Economic and infrastructural development. “We have watched very closely the activities of Sen. Shehu Sani that are anti-people of Kaduna state. He has since lost focus in the discharge of his legislative duties to meddling into State executive business, truncating democracy and hampering developmental dividends that the people of the state enjoy from the administration of Nasir El-Rufai. “As a civil society group conscious of our responsibility to identify with positive developments, we are deeply saddened by the disposition of the Senator and his pay masters towards the $350 million Kaduna State loan which was part of varying amounts that all other states of the federation have applied for and awaiting the endorsement of the National Assembly. 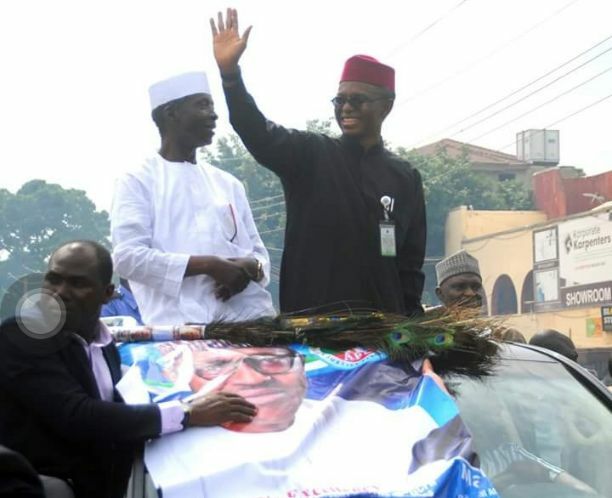 “We find the senator’s pedestrian political style retrogressive to the people of Kaduna State. We make bold to say that our people did not sign for infantile game of politics that Senator Sani has been notorious for. Playing the ostrich with Kaduna State’s matter in this case is clearly a deliberate attempt to undermine the wishes of over two million people of this State who deserve nothing short of a serious-minded lawmaker, conscious of the responsibility on his shoulders as the eye and ear of Kaduna Central in the upper chamber of National Assembly. “We cannot, at this stage allow for theatrics over such crucial matter. If the Senator and his pay masters think they can ride roughshod over the interest of Kaduna people on the matter of the $350million loan, they should have their heads examined immediately. Enough is enough of this playing to the gallery. After serially attacking President Buhari and the party in the media for nearly two years, we also note with dissatisfaction how he has serially attacked political appointees from the State he claims to represent as a means of getting media attention. This is childish, undemocratic and it ridicules standard practice in modern political Kaduna State,” the group opined. The coalition said that they are not just on their own, but represent a consortium of over 100 civil society organisations in the state to press forth their demands. “We have made deep research and follow up on all the funds that were been received since the Mal Nasir El-Rufia administration came to power, even the very recent bailout funds that was giving to the State, how it was judiciously used to clear all outstanding workers salaries, arrears and pension to date, Apart from on-going project across the three senatorial zones. We therefore did not see any reason why a Sen. Shehu Sani would because of selfish, personal ambition try to sabotage the effort of the State government to access a loan of $350 million”.